ALUMINIUM Bahrain (Alba) has further enhanced its cache of international awards following announcements recently it has been honoured with two prestigious international prizes, one for environmental best practice and the other for occupational health and safety. The former accolade is part of the International Green Apple Awards 2014. “This win brings international recognition to Alba’s commitment towards creating and maintaining a sustainable environment, thus fostering a healthy work environment for its employees,” an Alba statement said. Hailed as one of the world’s foremost campaigners for the environment, the Green Apple Environment Awards were established in 1994 and recognises, rewards and promotes environmental best practice around the world. Alba will be presented with its trophy and certificate at a glittering presentation ceremony in The Houses of Parliament, UK, on November 10. The other honour came as the 2014 Gold Award for Occupational Health and Safety given by the Royal Society for the Prevention of Accidents (RoSPA). It testified to the company’s commitment and efforts towards ensuring workplace safety. The RoSPA is a UK-based organisation that has been presenting its prizes for over 50 years. 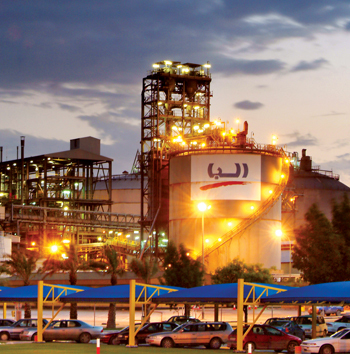 The company has consistently maintained a high track record of safety, health and environment, and has earned international praise and numerous accolades over the years – the United Nations Environment Programme (UNEP) environment award, the GCC award for the Best Environmental Activities by an Industrial Establishment and the Shaikh Khalifa bin Salman Al Khalifa Award for Industrial Excellence among others. Established in 1971 as a 120,000 tonnes per annum smelter, Alba today produces more than 912,000 tonnes of the metal including standard and T-ingots, extrusion billets, rolling slab, properzi ingots, and molten aluminium.